Timmy’s second sent out wasn’t much more successful than his first; coaches just didn’t seem to respond to the information Timmy’s mom sent out on Timmy’s behalf. By this point Timmy’s junior season has come to an end and Timmy still has never had a quality conversation with a college coach. After the debacle Timmy had last season with basketball he decided to sit this year out, taking the entire winter off from sports. Timmy also decided to take time away weight room at this point as well. As the winter turned into spring Timmy faced the choice of running track as he did last season or playing baseball which he skipped last year to run track; Timmy decided baseball was his best bet. Not being sure of which sport he wanted to play in college Timmy felt baseball opened up another avenue if football were to fall through. 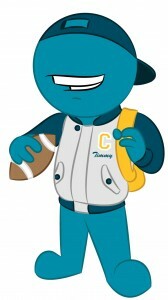 Timmy had high hopes of finding a D1 school that let him play both football and baseball. To further his opportunities at getting noticed Timmy’s parents enrolled him into a national baseball showcase being held a couple hours away. Timmy jumped at the chance to show his skills! While Timmy was at the showcase he played well, well enough to where he thought he should be called by most of the coaches in “attendance.” When Timmy got home from the showcase he spent the next week hovering near the mailbox practically tackling the mailman every time he came around. Timmy’s disappointment grew each day passes because nothing was coming in the mail for him. This week features 4 mistakes made by Timmy, SPOT THEM, and CORRECT THEM! Correction: The biggest mistake a recruit can make is to rely on their coach for recruiting. It’s not your coach’s responsibility, it’s yours. If you are lucky your coach will lend a helping hand but don’t count on it being there. Correction: I always hear about Mom’s and Dad’s doing their kids recruiting for them. Again, it’s not Mom and Dad’s responsibility, it’s yours! Coaches don’t enjoy hearing from Mommy and Daddy, they want to hear directly from you because you are the person that COULD be playing for them. You need to step up and start working for something you want! This title is intriguing, I want to open the email and learn about this young man. Correction: College coaches aren’t very positive towards mass email send outs. It tells them you are lazy and you didn’t care enough to learn about them or their program; why should they want to learn about you? Coaches enjoy responding to athletes who have clearly thought out why they have a particular interest in the school is it academics, a major offered, coaching staff, location, etc.? Correction: If responses weren’t good the first time doesn’t it make sense to change the method? Timmy’s first send out was clearly unsuccessful which meant he should have scrapped it, done some research about better ways to contact coaches , and followed a new plan of action.